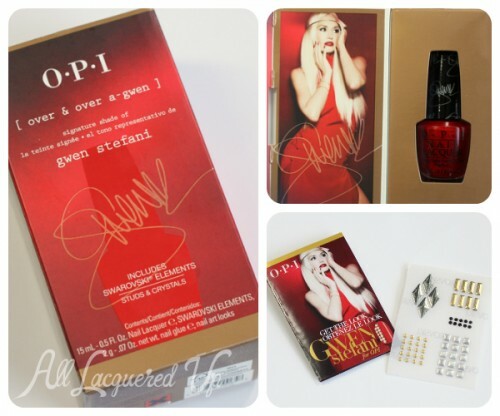 The Gwen Stefani for OPI collection is finally here and all I can say is, IT’S ABOUT TIME. Seriously, how it’s taken this long for the music and fashion icon to come out with a line of nail polish, baffles me. She’s as known for her red lips and tips as she is her unique vocals. Not that she doesn’t stray into the world of nail art, mind you, but when I think of Gwen, I think of bold, fierce red. So it should come as no surprise that this collection is highlighted by a signature red shade, Over & Over A-Gwen, that comes in its own Gwen-ified packaging. 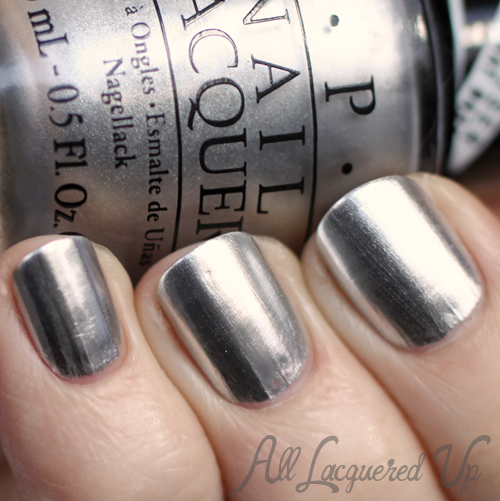 In addition to that, we have six new shades in a range of finishes including OPI’s attempt at a true chrome. Check it out! OPI is a 4-free brand (Formaldehyde, Toluene, DBP and Formaldehyde Resin). The OPI Pro Wide brush is flat, wide and medium in length. It’s of average stiffness and easily spreads out on the nail when pressed. The only downside to the Pro Wide brush is that it can be too wide for slim fingers or little toes. In this collection there are three cremes, two satins and clear-based glitter and a chrome. I’m not sure what differentiates Satin from Matte Suede other than a naming convention. 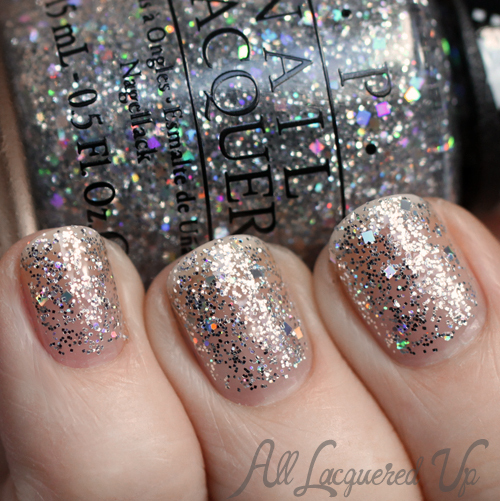 Outside of the glitter, they are all well pigmented, requiring only two coats, and buttery smooth. The only issue I had is with the chrome, Push and Shove, and I’ll discuss that below. Let’s start with Gwen’s signature shade, OPI Over & Over A-Gwen. You can’t do a collection about Gwen without a hot red and this one is super saturated and rich. Are there dupes for it? 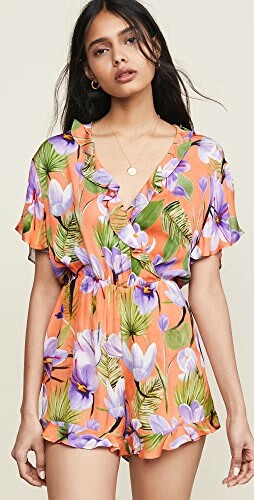 Undoubtedly, but no one is buying this because it’s a super unique shade. 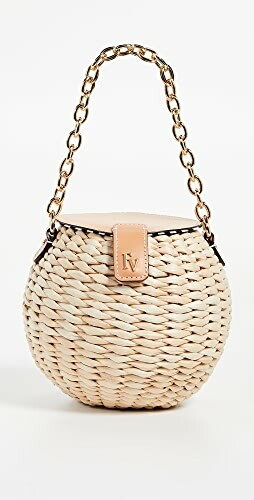 They’re buying it for Gwen, the packaging and the Swarovski elements inside. Speaking of, the packaging on this one is sublime. A total collector’s hoarder’s delight. Inside you’ll find a booklet with nail art ideas, OPI nail glue (not pictured) and the aforementioned Swarovski crystals & studs. OPI 4 In The Morning is a charcoal satin with tiny flecks of gold. It’s very pigmented and smooth but when it dries, there’s tangible texture. Not rough, per se, but definitely noticeable. Personally, I prefer it with a top coat. the gold flecks really pop. 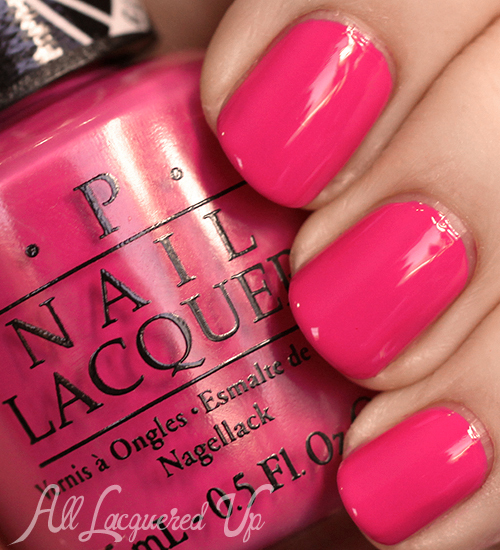 OPI Hey Baby is a bright rosy pink creme. It’s bold and punchy and makes me think of her “Think Pink” September 2012 Harper’s Bazaar cover. The color looks a bit more bold and magenta than it is in real life. This type of shade can be so hard to capture accurately. 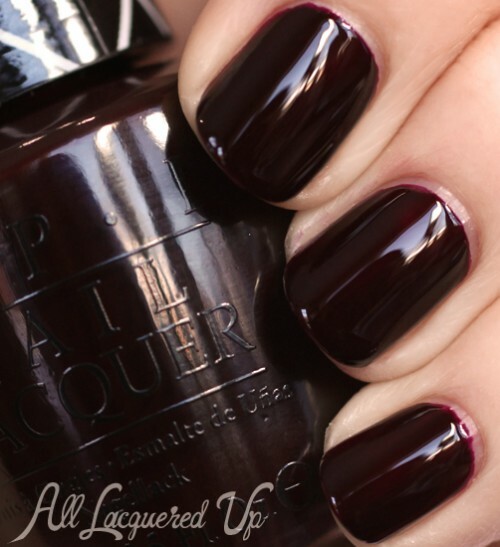 OPI I Sing In Color is a vampy raisin creme. It has a lot of berry in its base, which you can see on the first coat, but once the second goes on and it dries, it treads on “almost-black” territory. The formula is thin and easy to control so it’s a breeze to apply. 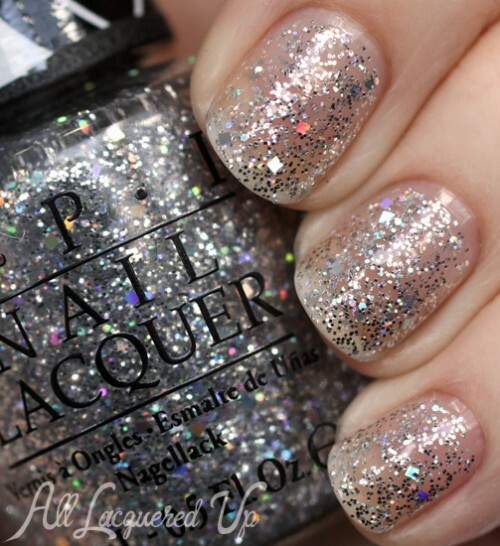 OPI In True Stefani Fashion is a clear based glitter filled with tiny silver particles and chunky square holographic pieces. The glitter is pretty dense and not so big that the brush has a hard time scooping it up so you don’t need any special glitter application techniques to get an even placement. 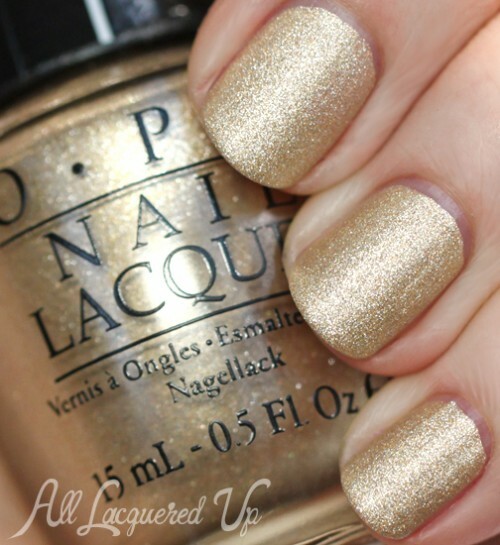 OPI Love.Angel.Music.Baby is a luminous pale gold satin shimmer. It dries with a much smoother texture than 4 In The Morning. The shimmer on this is really stunning and while adding a top coat brings out some extra shine, it’s not as noticeable a difference as its darker satin counterpart above. Let’s get one thing straight from the start, you’re not applying lipstick, looking into your nails, anytime soon. Don’t get me wrong, Push and Shove is a great concept and probably the closest a polish has come to replicating Minx, but at the end of the day, it’s still not Minx. Polish manufacturers need to stop trying to make fetch happen with that idea. All that being said, it does look like brushed metal. While you do have to be careful in your placement, most brush strokes melt away as it dries. The downside is that every little nail imperfection will be magnified, as evidenced below. If you have perfect nails, you will love this. Peeps with ridges and dents, peace out! Note: You MUST wait between each layer. Applying polish over wet base coat will make it streaky and lumpy. Applying a second coat over wet polish will do the same. I waited five minutes between each coat. I’m sure, like me, you are thinking about what you could put under Push and Shove to make it better. First, I tried a coat of ridge filler UNDER Lay Down That Base, letting each coat dry for 5 minutes before adding P&S. Fail! Like lumpy disastrous fail. 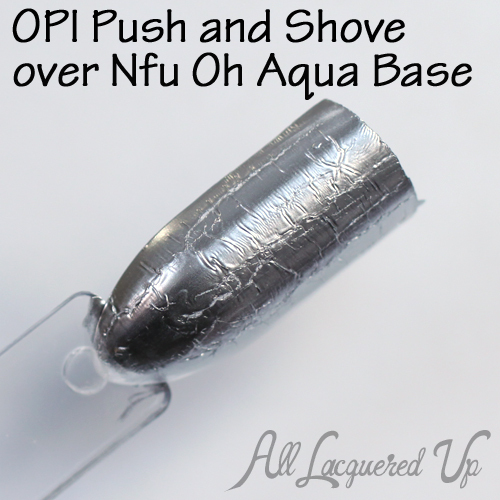 Next, I tried it over Nfu Oh Aqua Base since it’s designed to be worn under chromes & holos. Because my patience for testing this on my nails had worn thin, I tried it on a nail stick. Well, you can see how well that turned out. I waited over 30 minutes and this still happened. I don’t know what in Lay Down That Base (no ingredients list on the package) but clearly it’s necessary to P&S’s life. Finally, I wanted to see what would happen if you add a glitter/shimmer top coat. It totally dulls the finish, clouding the brushed chrome look. 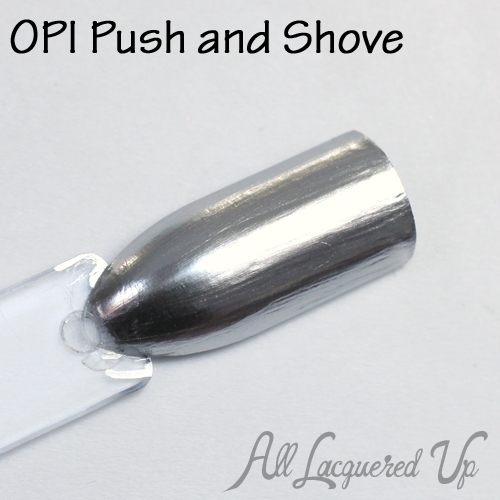 Bottom Line: Despite magnifying my nail flaws, Push and Shove is pretty damn cool. The lack of wear time makes it a bummer though. I mean, who wants to make all that effort if it’s going to start chipping in a few hours? And what do you do when you run out of Lay Down That Base? Outside of the collectible nature of Over & Over A-Gwen, the cremes get a pass. They’re quality but not unique. Both Satins are stunners, even better with top coat, if you ask me. And since I don’t see square holo glitter that often, I’m feeling In True Stefani Fashion. 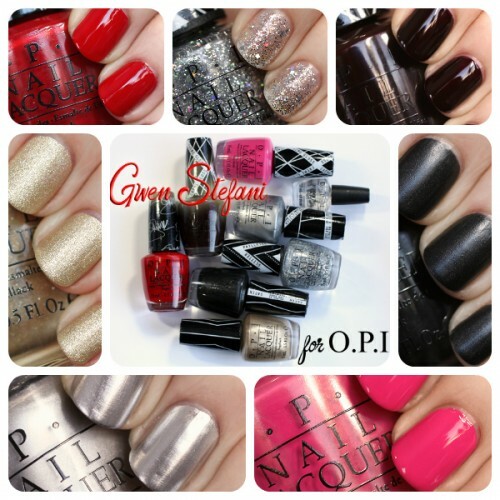 Gwen Stefani for OPI is available now at salons and select retailers nationwide, including ULTA stores and ULTA.com. OPI nail polish retails for $9/ea for a .5oz bottle. The boxed set including Over & Over A-Gwen and Swarovski Elements will retail for $14.95/ea. 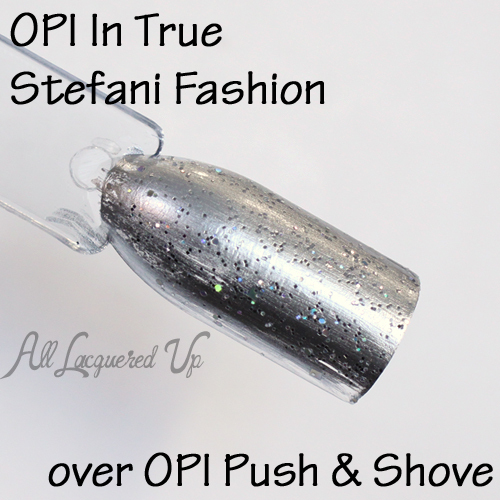 So, do you all like this collaboration from OPI and Gwen Stefani? Is it what you expected? Which shades do you plan to pick up? 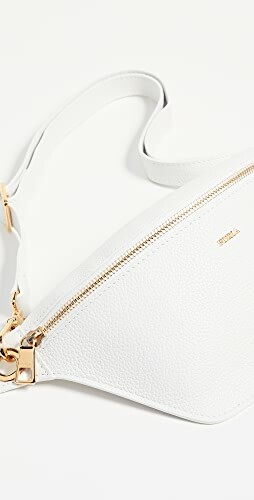 Disclosure: I purchased the products reviewed in this post. 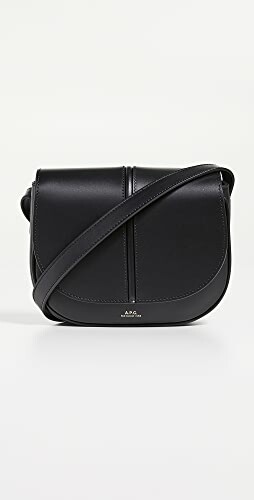 Affiliate links appear in this post. When you purchase through an affiliate link, you help support this site. For more info view my Disclosure Policy. Marc Jacobs “Stone Jungle” is a dupe for this–and longer wearing, IMO! …and by “this” I was referring to “Push and Shove”! Thanks Erin! I haven’t tried that one yet. It’s so expensive. Can you put top coat over it? I don’t wear reds well so I wasn’t overly excited about the line. I wish the crystals and studs had been packaged separately. Nice experiments with the different base coats! Thanks for doing the hard work for the rest of us! I’m loving the 2 different looks you can get from 4 In the Morning based on whether you use a top coat, though I’m still torn which I like better! And while I Sing In Color isn’t exactly groundbreaking, it’s a beautiful color that I could see myself getting a lot of wear out of. Thanks for the detailed review! OPI hasn’t impressed me in ages (except for Alcatraz Rocks), so I’m kinda thrilled they’re releasing a Gwen collection. I think I’ll skip Push and Shove, but 4 in the Morning looks cool. I might get the red shade just because it’s her signature shade. How long was the wear time on Push & Shove? I wonder why it’s so short lived on the nail. I didn’t wear it for that long so I can’t give you an exact time. I did notice some tip wear starting after a few hours and washing my hands. Others have reported chipping and wear in around 12-16 hours but that’s just hearsay. Push & Shove reminds me of the new Formula X for Sephora “nail foil.” (Why do companies name their products after completely different things that already exist?) It also requires its own special base coat, is “no top coat needed,” and boasts one-day wear. http://www.sephora.com/the-foil-look-P384314?skuId=1574466 Sephora’s website doesn’t have ingredients, either! Wow, P&S really does need it’s teeny special base. Too bad. Glad I already have the Layla brand chromes which look the same and have better behavior all-around, haha. Thanks for your swatches! The Aqua Base “fail” makes me giggle… why buy the China Glaze crinkled chromes when you can crinkle a chrome all by yourself?! Ha, you’re so right. I was thinking it looks like crackle, without the full on splitting. Huh. I didn’t realize that chrome finishes were so unusual? I have four in different colors, and they cost me $8 each. They were from a tiny little unknown brand, but still- the finish I got was this good or better every time! I wore it on recently buffed nails sans base coat or top coat, but even so it lasted me several days. I can link you to my swatch if you’d like but I’m not here to push my blog on anybody, I’m just befuddled because I had no idea that chrome finishes like that were such a rare or difficult thing do find! I think the only photo that’s on my blog proper is from 31DC, here: http://fedoraharp.blogspot.co.il/2013/09/31dc2013-day-8-metallic-nails.html (I’m actually really pleased with these, the shade pictures are the best but even with topcoat they look pretty rad) but now that this Gwen Stefani shade is pulling so much focus in the polish blog circles, maybe I’ll post proper swatches of my chromes! I don’t have a silver but it wouldn’t be hard to grab one on my way home from work one day. Great review! Feeling a bit meh about this collection myself . . . was expecting more I guess. Actually more excited over the caps on the bottles than the colors )-: Disappointed that P&S is such a shame . 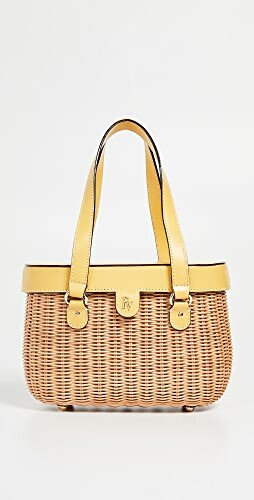 . . it was the only one I really found tempting. I’m guessing an sog mani would give the smooth surface it needs and maybe make the finish smoother. Thanks!! I’m curious how it applies over gel polish, so if you try it, let me know. About P&S over gel polish, I saw someone post a photo of it in my nail art stamping group. It was gorgeous. No dents, no streaks. The mirror effect was really achieved. I applied push and shove with its base over a clear base and top coat of gel polish. It turned out great. I’ve yet to see how long it lasts. I was HIGHLY disappointed with Push And Shove. I’m dying for a chrome mirror finish polish. Oh well…. 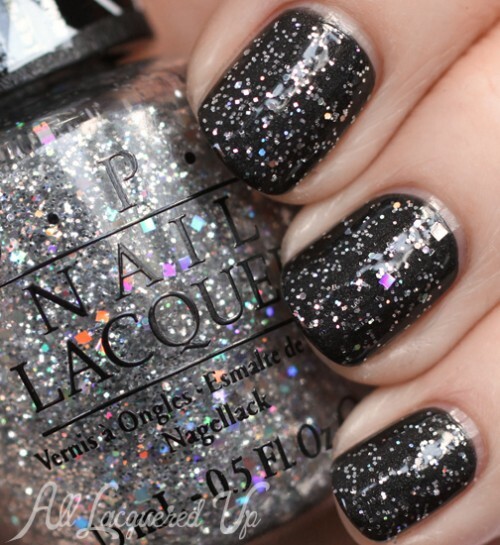 It’s interesting to me that so many people first think of Minx-wannabes when polishes like this pop up these days. It always reminds me of the Maybelline Mirror Image polish that came out ages ago. It seemed really unique at the time, and I’d definitely heard about (and tried) that before I’d heard of Minx. Just a slightly different perspective. I definitely agree that many companies, and especially OPI, pick the worst and least informative buzzwords for their promotional materials. Hi D! I always forget about those Maybelline polishes. I never got them, only saw pics online after the fact. Thanks for your hard work and the pics! I do have the 2 satins and the glitter and I’m in love. For NYE I wore LAMB with the glitter as an ombre and got a ton of compliments on my mani! I adore the squares! Thank you for the lovely review! I just went out today and purchased the whole Gwen collection (yaaaay! ), but I have yet to use it. After reading this I’m so excited to try them! Especially P&S! Hopefully it works for me! I picked up in true stefani fashion last night, the rest seemed sort of ordinary to me.. I did try Push and Shove–my nail salon had just gotten the collection in and I loved the look of it. BUT–what a disappointment. The nail techs apparently hadn’t had enough time with the collection to know that it wears so quickly. I got my nails done in the late morning and by evening the polish was already wearing off. It wasn’t chipping, but it looked liked faded old paint. The only nails that didn’t do this were the two that had the glitter polish on top. Not the great New Year’s Eve look I was hoping for. Oooh, loving 4 in the morning. Agree that it’s better with a top coat. I just picked up Push and Shove at Beauty Brands. I don’t have anything quite like it so I thought I’d give it a try. Haven’t had time yet, but I do have the ingredients for Lay Down That Base. It came in a dual pack kind of thing and has the ingredients on the packaging. Hi! Just purchased P&S and tried it on two of my already manicured nails (got a regular mani on Saturday, Essie’s Chinchilly and Good to Go as a top) … its been 4 hours and I’m keeping an eye on them as if my hands are going to spontaneously combust. LOL. My take on it: Over fully manicured nails it went on pretty smooth. Hardly any imperfections came through. I used Drop that Base on my left hand and applied it sans base on my right. The one with Drop that Base crinkled and the other one is still smooth. Let’s see if maybe the trick is getting a mani before applying P&S. Yes, definitely report back on how it wears. Though how odd that it wrinkled over Drop That Base. How long did you let it dry? If it’s still wet, it won’t apply right. so what happens when you run ouit of the “lay down that base”? You can no longer use P&S? I used the glisten & glow H K girl topcoat over push & shove and it didn’t dull it at all from what I can tell. I only put it on a couple nails so that I could check that. I definitely plan on buffing my nails before I use it again though. The ends of my nails are smooth from when I last did it a while back and they look great. The ridgey base? Not so much. Is zoya dovima a dupe for 4 in the morning? Very nice OPI collection. Love it! I was wondering how opaque love angel music baby is? I’ve been looking for an OPI gold to try with stamping. Do you think it would work?